Almost through the Nice Stems! collection - here is Be A Dahlia Won't You? - a red with purple shimmer. This color reminded me a lot of OPI Wing It! from the 2010 Summer Flutter collection, but they are slightly different (promise!). There's a joke here about nail polish junkies really knowing all the tiny differences in polishes, but I'm not quick enough to make it. ;] I used a base coat of OPI Natural Nail, 2 coats of polish and a top coat of OPI Top Coat. 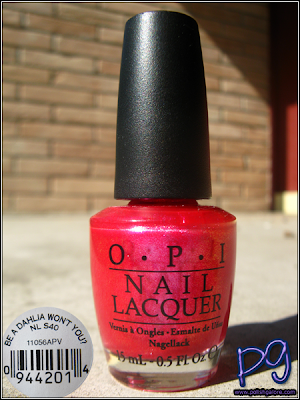 The formula was super nice on this polish - good job on OPI for this collection so far! In the sun, you can see the purple showing already. This is supposed to be a fuchsia shade, but I'm just seeing more red than anything. It's a pretty color - lots of sparkle in it. In the shade, it's all about the purple shimmer. Talk about a stunner! I definitely can see myself wearing this color often.